As promised, here is a peek inside this month's Dekabox c/o the lovely folks at skoshbox. For more on what skoshbox is see our previous post over here. 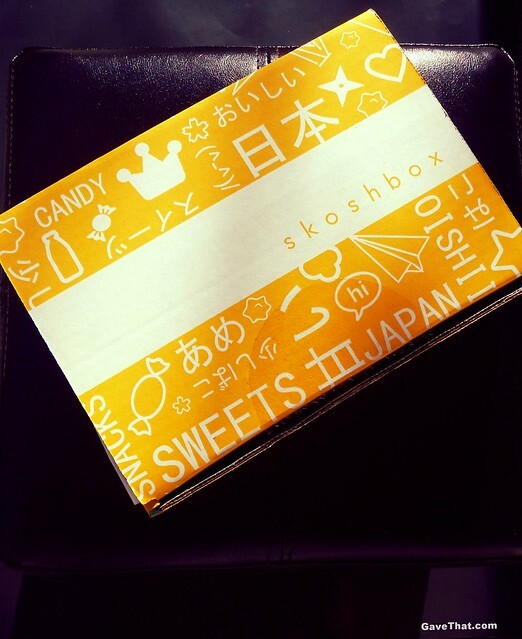 Each month skoshbox curates two different sized exploration boxes of authentic Japanese snacks. This time we're unboxing the larger of the two, the Dekabox. Keep reading for: THE REVIEW > Once again I'm joined by Magda (of Photos by Magda) for a Dekabox snack fest, this time while watching a classic Gappa flick (we're huge Godzilla / Kaiju fans). We tried to keep notes but I'll just come out and say that these are some of the best foodie subscription service boxes we've ever had to date. And we've sampled a lot between us. 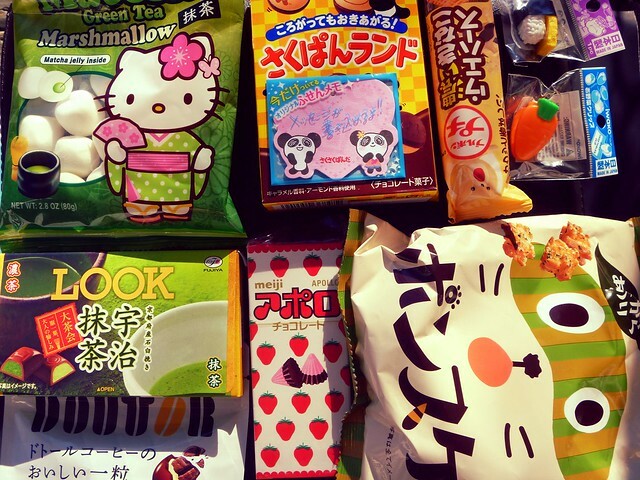 If you know someone even remotely in love with Japanese treats send them one of these and they'll love you forever. OK, on to the spoiler of what we found awaiting us in this month's Dekabox: First up was a carry over from the smaller skoshbox we reviewed previously, these absolutely delicious SAKUPAN-LAND さくパンランド bon bons filled with almond paste and coated with chocolate. You can see and find out more about them over here. What was different about this box was they came with cute heart post-it-notes attached to them! Something else familiar with the other skoshbox we reviewed were these marshmallows although these are in the SANRIO HELLO KITTY MATCHA キティちゃんの抹茶マシュマロ marshmallow flavor. The others were slightly bigger and in chocolate. We're still debating on how best to use these. I was thinking in some sort of hot drink or a s'more of some sort. Magda said she couldn't get into them. Green tea I have to admit can have stark love or hate reactions I've found. Some love the bright, uniquely green flavor, especially when mixed with something sweet (raises hand). Others say it reminds them of minty grass. When it comes to these little marshmallows, they have a green tea gel inside of them that is both sweet and almost fruity. Keeping on the theme of green tea are these LOOK GREEN TEA CHOCOLATES ルック大抹茶. Little dark chocolate squares with super vibrant green tea filling. For years now I've so badly wanted to try the green tea Kit Kats. Now that I've been able to try these Look ones, I feel as if I have a better idea of how they'd taste. Green tea and chocolate, I just don't know. The chocolate on these is rather Palmer easter bunny quality if you know what I mean which was odd considering how amazing the matcha was. A lot of the chocolate has been coming off that way which is why the next candy was such a surprise. They're the DOTOUR COFFEE BEANS ドトールコーヒー豆チョコ and they ended up being some of the best chocolate covered coffee beans we ever had. The chocolate was luscious in an almost dark Raisinettes sort of way which plays off perfectly with the richly roasted coffee beans. In the center there even seems like extra flavorful instant coffee granules. No bitterness, no rock hard tooth breaking coffee beans. So, so good. Then we grabbed the long package KINAKO WAFER COOKIES プチきなこウェハース with a teddy bear on them that looks very much like that Ted character. These were our first time trying Kinako which is roasted soybean powder. It has a unique flavor that I find similar to roasted rice. These tiny, super cute square Kinako cookies fall somewhere between puffed rice (Honey Smacks) and those age old Sugar Wafers they sell in vanilla and strawberry. Perfect with tea. 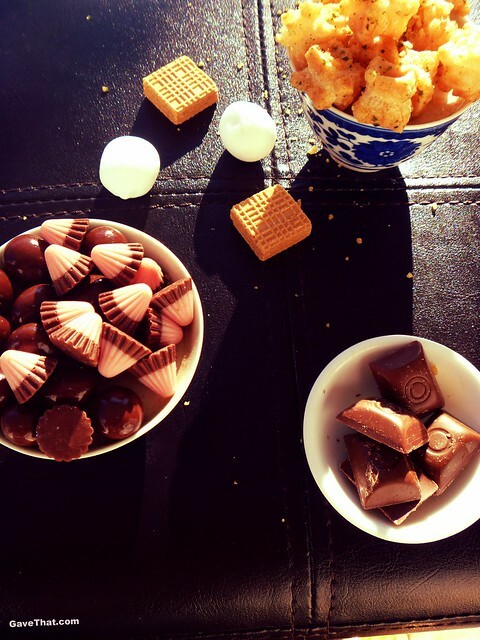 Then there was a little box of APOLLO STRAWBERRY CHOCOLATES アポロチョコレート . These are one of the few Japanese candies that, along with Pocky, are pretty easy to get a hold of, even in smaller convenience stores. The problem is how disappointingly stale so much of it is which is why we both kind of gave up on buying it of late. These and everything else from skoshbox is so fresh it's not even funny. It makes out own local snacks taste stale by comparison so it has been nice knowing we've been tasting things how they should be. One thing we've learned is Japan produces some of the best strawberry anything. Since these have a bit of a milky flavor going on it reminds me of strawberry Nesquik only 10 times better—less sweet and with chocolate. Now for the last snack which I have to wager was the best in the entire Dekabox. These PONSUKE NORI SENBEI BITES ポンスケ甘辛のり. Senbei, which are traditional rice crackers, were in our other skoshbox but these take things to another level. We were bracing ourselves for serious seaweed flavor but these actually have barely any nori. You can see the flecks but it melds into the sweet and savory coating that is thoroughly addicting. 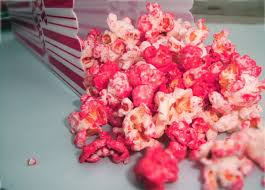 I've had something similar to these in the past but all of the flavors create something so multi-layered that it's almost impossible to mindlessly eat these. Also included in this month's Dekabox were two non-edible treats; an eraser in the shape of a piece of sushi and a little carrot bag clip which never ended up being used because we polished everything off. Of course you could also visit the skoshbox snack shop online and pick out your own snack combinations to send to a friend. See more about that over here. Otherwise, which box to give (including as a self gift!) is going to depend. Magda felt that the smaller skoshbox was more adventurous and the larger, 1 pound Dekabox was perfect for exploring with friends. Both are awesome and come in subscriptions of varying lengths. Find out more over here and use our special code: GAVETHAT01 for a discount off your first subscription order. 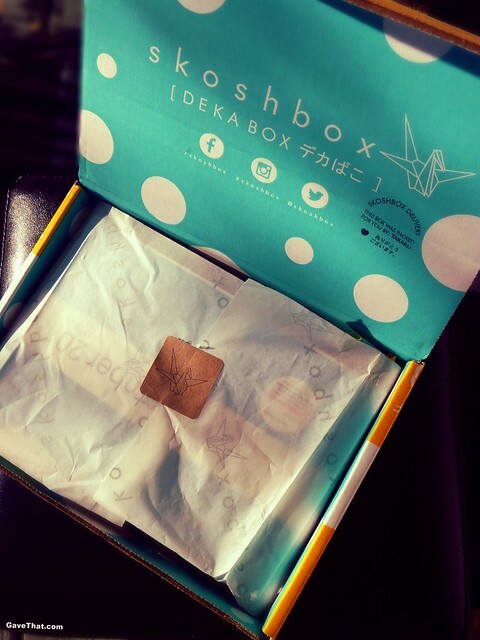 Dekabox c/o skoshbox, thank you Takako and skoshbox!